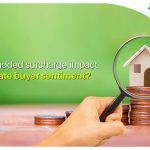 Will an added surcharge impact real estate buyer sentiments? Ready Reckoner rates refer to the minimum notified rates by the government through the registrar or sub-registrar for the registration of a property transaction. Stamp duty is payable on property transactions at the assessed value based on the ready reckoner rate chart by area/sector in regions such as Mumbai. Hence, an average increase in the ready reckoner rate has a direct impact on the price payable by the end consumer. The BMC in their recent budgetary announcement has proposed a surcharge of 1% to fund infrastructure projects. This additional charge on home-buyers at the same time that the state government increased the ready reckoner rates by 3.95% thereby increasing stamp duty, has been met with some resistance from the industry. In a tepid sales environment, these additional charges could hinder buyer sentiment that has over the course of February and March gradually improved across different ticket sizes. Demonetisation saw even bullish buyers sit on the fence but the budgetary announcements combined with the election results saw some positivity return to the market. With excess inventory and declining sales, any increase in price across ticket sizes that is transferred to the end buyer could hamper sentiment and impact the government’s larger ‘Housing for All’ agenda, especially in an expensive real estate market such as Mumbai. In 2012, the ready reckoner was increased by 17%, 2013 by 12%, 2014 by 13%, 2015 by 15% and in 2016-17 it was increased by 7%. In Thane ready reckoner rates were increased by 3.18%, Ahmednagar saw the highest increase of 9.82% on an average and Nagpur saw the lowest increase at 1.50%.